Johann Wolfgang von Goethe? John Anster? William Hutchison Murray? Apocryphal? Until one is committed there is hesitancy, the chance to draw back. . . The stuff we ask you for, at once produce us. Anster wrote the phrase “What you can do” and not “Whatever you can do” which has become common in modern times. QI believes that the lines above should be credited to Anster with an inspiration from the words of Goethe. The passage containing the word “hesitancy” that was also mentioned by the questioner was from neither Goethe nor Anster. An explanation is given together with the 1951 citation presented further below. Whole days are lost lamenting over days. But work away because ye must. “What’s left undone to-day, to-morrow will not do. And start the brew without delay! And one should let no day slip by. And you will labour on because you must. It will be noted that Anster’s translation is a very free one—really a paraphrase, or, as some one has said, the translation of a poet by a poet. In modern times parts of the text above have sometimes been directly attributed to Goethe. In fact, none of it was written by Goethe. The couplet was from Anster and the rest should be credited to Murray. In conclusion, QI believes that the 1835 text from John Anster was distinctive enough that he should be credited with its authorship; although, one should also note that he was inspired by a passage in Johann Wolfgang von Goethe’s “Faust”. The German text in 1808 should be credited to Goethe. The English translations from 1880, 1909, and 1941 should be ascribed to both Goethe and the translator. 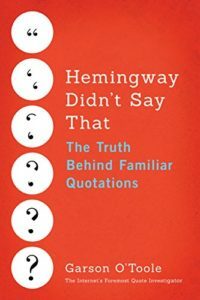 Quotations using the 1951 words of W. H. Murray should not be credited to Goethe. Image Notes: Portrait of Johann Wolfgang von Goethe circa 1787 by Angelica Kauffman. Picture of wingsuit in flight; author: Richard Schneider from Los Angeles; licensed under the Creative Commons Attribution 2.0 Generic license. Images from Wikimedia Commons.